We evaluated comorbidity, hospitalization, and mortality in chronic obstructive pulmonary disease (COPD), with special attention to risk factors for frequent hospitalizations (more than three during the follow-up period), and prognostic factors for death. Two hundred eighty-eight consecutive COPD patients admitted to respiratory medicine wards in four hospitals for acute exacerbation were enrolled from 1999 to 2000 in a prospective longitudinal study, and followed up until December 2007. The Charlson index without age was used to quantify comorbidity. 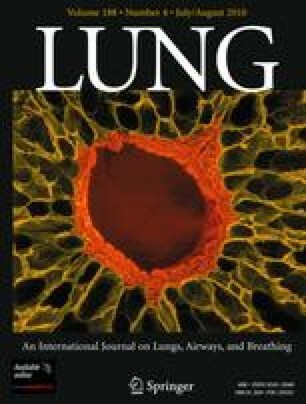 Clinical and biochemical parameters and pulmonary function data were evaluated as potential predictive factors of mortality and hospitalization. FEV1, RV, PaO2, and PaCO2 were used to develop an index of respiratory functional impairment (REFI index). Hypertension was the most common comorbidity (64.2%), followed by chronic renal failure (26.3%), diabetes mellitus (25.3%), and cardiac diseases (22.1%). Main causes of hospitalization were exacerbation of COPD (41.2%) and cardiovascular disease (34.4%). Most of the 56 deaths (19.4%) were due to cardiovascular disease (67.8%). Mortality risk depended on age, current smoking, FEV1, PaO2, the REFI index, the presence of cor pulmonale, ischemic heart disease, and lung cancer. Number and length of hospital admissions depended on the degree of dyspnea and REFI index. The correct management of respiratory disease and the implementation of aggressive strategies to prevent or treat comorbidities are necessary for better care of COPD patients.